Smart digital technology is producing a rapidly growing amount of customer and product-usage data. Many traditional product companies are starting to put this data to work to transform themselves into digital businesses. But to do so successfully requires a different approach to business creation; it requires the development of a digital business model. Digital marketing and e-commerce have completely changed the ways and channels through which we reach and persuade customers. The next great leap forward is shifting from doing traditional business towards digital. In digital business, you make use of the rapidly growing amount of data that the physical and digital worlds generate to create new, digital value propositions. Such propositions offer many more business model options than traditional product value propositions do. They even provide opportunities to revolutionize complete industries, such as what’s happened in the music industry with Apple and Spotify as disruptors. Data-driven value propositions offer a great advantage over traditional ones: the more they are used, the more valuable they can become. The data generated allow you to identify patterns that enable continuous optimization of the proposition – and to create new ones. Unlike traditional propositions, successful digital ones become self-propelling. Data is becoming an asset for value creation not only because of the growing amount of it that is available from many sources, but also because digital data – unlike traditional market research data – is increasingly fresh, precise and ‘real-time’. This gives you greater speed and accuracy in understanding your target customers, and adapting and controlling your business world. The data that a digital business model uses can come from anywhere. Anything that happens at a data point or sensor is potential input. The ultimate goal is to turn sets of current (or creatable) data into new information of high value to target customers. However, to stay ahead of the curve, it’s also necessary to continuously adapt your value propositions to customer’s changing needs. Inventory the stakeholders and ecosystem related to your customers and the types of data on hand. Take also a good look at what’s available at the periphery of your operating sphere, such as through government and players from adjacent industries. Once you have a comprehensive overview of the players and the potential data at your disposal, you are ready to explore how you could connect them and select the role you could take in the ecosystem. Brainstorm how you could use data to address unmet needs in your ecosystem in a unique way. This is easier said than done. You must be able to understand and interpret the needs of your potential target users as well as relationships between different data sets. Moreover, you must crystallize exactly what kind of new information/insights you can produce from current (or creatable) data that your target customers will find valuable, in what form you would offer this to whom, and who will pay – as well as how – in the end. Digital creates new opportunities for potential paying customers. What your initial role and that of potential partners is in the ecosystem, and how they will evolve. How you will organize yourself and capture necessary data to deliver on the needs – now, and in the future. How you will capture the value, how the sources and channels of income will evolve over time, and what share of business you are entitled to. Delivering data-driven value can impact many elements of your business. You may need to make specific core competences or technology, such data analytics and sensors, a more important part of it. Your revenue streams – even who your paying customers are – may change. Good business modeling will help you in rethinking the logic of your business and how it will work in the future. We have deep insight and broad experience in developing digital business models and value propositions. Please feel free to contact us to discuss what – and how – digital business could add to your business. 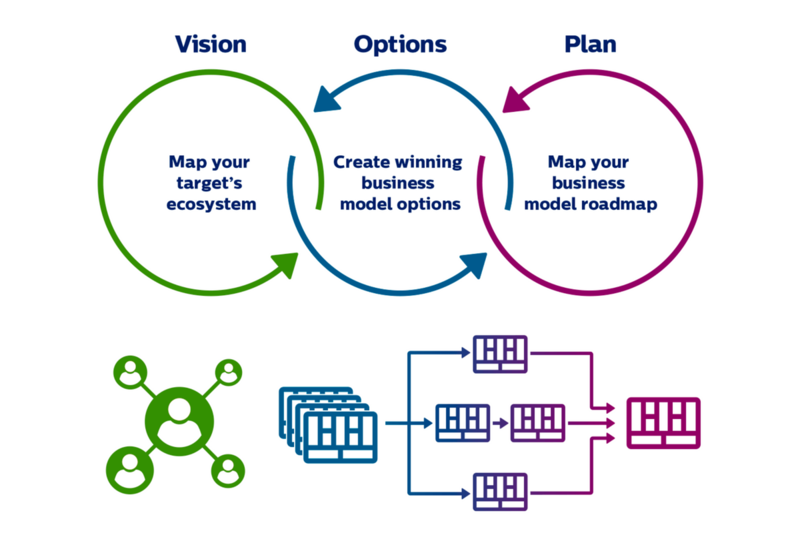 Looking for digital business model development?